There is great diversity in number and type of tillage operations used to grow corn and soybean in east-central Illinois. As 2019 appears to be a low-income year, reducing tillage passes is one way to reduce costs. This may be more of an option in 2019 since fewer fall tillage passes were completed in late 2018 due to wet field conditions. Moreover, statistical evidence does not suggest that yields increase with more tillage passes. The diversity in on-farm tillage practices is demonstrated using data from Precision Conservation Management (PCM). Precision Conservation Management (PCM) is a farmer service program led by the Illinois Corn Growers Association in partnership with over 30 partners. The mission of PCM is to increase conservation practice adoption using farm business management principles. With 200 farmers enrolled in its 16-county service area, PCM represents about 200,000 acres of farmland in Illinois. Table 1 shows the percent of fields falling within various tillage “standards.” These standards characterize the number and type of tillage operations for the over 1,800 fields enrolled in PCM. A tillage pass includes a field operation whose primary function is to “work” the soil in preparation for planting. Planting, spraying, harvest, and fertilizer applications are not included in tillage passes. Tillage passes include chisel plow, field cultivator, vertical tillage, and disk operations. No-till — No-till does not include any tillage passes, but would include passes for spraying, planting, fertilizer applications, and harvesting. Strip-till includes one field pass to build strips. Strip operations typically — though not always — are performed in the fall. Rows then are planted in the strips. One-pass tillage is just that – one tillage pass. There is great variety in implements used to perform tillage (e.g., vertical tillage, field cultivate, combination tool, and disk passes). This summer, we will provide a more in-depth summary of tillage implements and their related economic costs. Two-pass tillage involves two passes to prepare a seedbed. Again, there is great diversity in tillage implements used. Many systems had a deeper tillage tool (e.g., chisel plow) followed by a lighter tillage implement (e.g., field cultivator or vertical tillage tool) for evening out or smoothing the soil surface. Three+pass includes three or more passes. For corn, only 13% of PCM fields enrolled were categorized as no-till (see Table 1). Similarly, 13% of fields were characterized as strip-till operations, meaning that 26% of fields were classified as some sort of reduced tillage system. Thirty-one percent of PCM corn fields were one-pass systems. The remaining fields had more tillage: 40% in two-pass and 3% in three+pass systems. For corn, there was no significant difference in yields between the strip-till, one-pass, two-pass, and three+pass systems. That is, more tillage did not result in higher yields for fields enrolled in PCM. While yields did not increase with more tillage passes, there is definitely higher costs with more tillage. Machinery cost estimates usually place the cost of different field operations between $10 and $20 per acre (see Machinery Cost Estimates). Higher costs with no increase in yields calls into question the economic advisability of performing more than one tillage pass for corn production. Within PCM, 46% of soybean fields were classified as no-till (see Table 1). 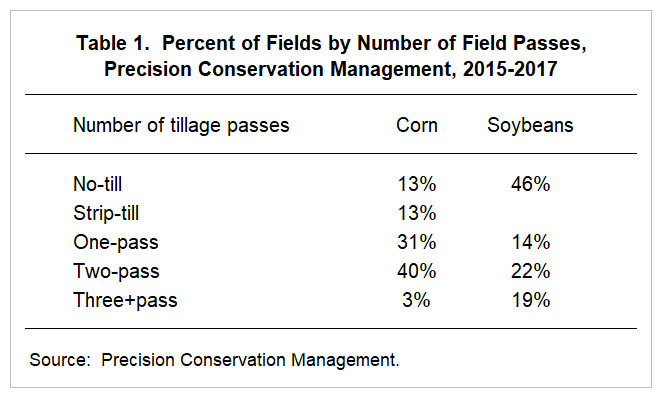 One-pass systems accounted for 14% of soybean fields, two-pass accounted for 22% of fields, and three+pass accounted for 19% of fields. As with corn, there was no statistical difference in yields between the one-pass, two-pass, and three+pass systems. That is, more tillage did not result in higher yields for fields enrolled in PCM. There is great diversity of tillage passes on central Illinois farms growing corn and soybeans. The PCM dataset indicates that there is no clear yield benefit from performing more than one tillage pass for either corn or soybean production. As a result, completing two or more tillage passes is a questionable economic practice. Lattz, D. and G. Schnitkey. “Machinery Cost Estimates: Summary.” Department of Agricultural and Consumer Economics, University of Illinois at Urbana-Champaign, June 2017.